Another year gone by, yet a new year ahead of us; a year full of aspirations, hopes and dreams. I wish all of you the very best in 2019, may it be a happy and successful one for each of you! I’d also like to take this opportunity to thank you for your loyalty. It’s you who make our magazine a success. Last year was a very challenging one for many. In India, there were elections in several states, with a change of the guard in some. People had fresh hope, eyeing new horizons. In May this year, we have our parliamentary elections, and we wonder what the future will bring – more of the same, or a change? On the international stage, oil prices dropped to low levels, employment rose, and in early October stock markets declined. It’s a period where we need to wait and watch. In Europe, Britain still battles with Brexit, and at the Saudi Consulate in Turkey, Jamal Khashoggi’s fate set off an international diplomatic crisis. For You & I, 2018 was a period of consolidation; we made inroads into new areas and strengthened those that we had before. Each member of our team worked tirelessly to contribute to our success; editorial, marketing, circulation, finance and administration, print and online; each has played an important role. Our readership has spread further across a spectrum of demographics, and the magazine has attracted new and different types of readers. We added a few sections in 2018 and have much more planned for you in the year ahead. If you have enjoyed reading the magazine as it has been, be prepared to enjoy it even more. Do tell your friends about You & I, and thank you once again for remaining so loyal to us. Another year goes by and with that You & I completes 11 beautiful years of existence. There is so much we have learnt in these past years that has helped us grow and learn, and all these experiences have brought us closer to you, our readers. With every issue, our team strives to deliver what is expected of us --- new and good quality content complemented by premium visuals. We hope to continue entertaining and absorbing you in a plethora of content for generations to come. Here, we present to you our 11th anniversary special that features great content on various subjects. Whether its fashion, sports, art, or travel that interests you, we have something for everybody in here! When you think of a person with a royal lineage, you imagine them to be stately, elegant, and righteous, and that’s exactly what Princess Esra, who dons the cover of this special issue, exudes. 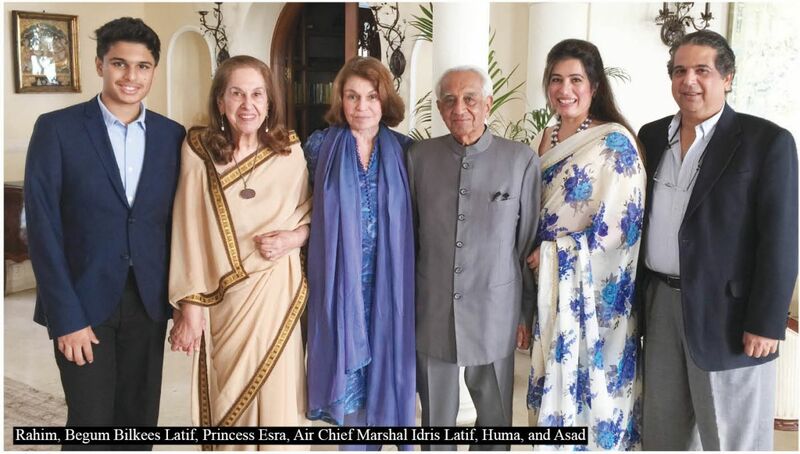 The amount of love and care that Princess Esra, the wife of the eighth Nizam, has for Hyderabad is truly amazing. I think every Hyderabadi should appreciate all that she continues to do to ensure that the legacy and heritage of Hyderabad is maintained. I was fortunate to have had the opportunity to interview her recently, and appreciate how candid, open, and warm she was in sharing so many things about herself, her family, and her extraordinary life. Read all about this wonderful and gracious lady in Cover Story. Taking the royal theme forward, our Feature Story delves into the glitzy and glam lives of royal women and men of all times, bringing to light some stylish ones who have made a name for themselves as fashion icons. We also have a Special Feature on Pearls, written by my sister Zakia Bilgrami Farooqui. Turn to the section to know more about the queen of gems. Our People in Focus section always has people from varied walks of life, and this time too, we have four highly talented individuals --- Sudha Reddy from Hyderabad, Sheetal Mafatlal and Gaurav Gupta from Mumbai, and Mandira Lamba from Delhi. All of them share fascinating details of their personal and professional lives with us. In Sensational Spaces, we have a beautifully written article on three striking hotels and resorts. While one is a resort in Japan, and another a hotel and spa in France, the third is a palace in India. This one’s a real visual treat! While women have been known to take their appearance very seriously, slowly and steadily, men are beginning to do so too. In Mind & Body we list out some of the most luxurious treatments that men can indulge in. And why not, vanity isn’t reserved for women alone! Make sure to check out the Wedding Moments section wherein we’ve presented the beautiful weddings of Sama Ali and Kaeshav Sahnan in Delhi and Barkath Alam Khan and Qudsia Owaisi in Hyderabad. Thank you for being our special and valued readers. We hope you enjoy this issue as much as we did, in putting it together for you.